Apostles dream, and then they act. This passage from Acts stirred up some lively debate among the pastors with whom I gather each Tuesday morning to study the scriptures in preparation for preaching. There was some concern that the story is too bizarre, too removed in its images and symbols to be easily understood by today’s readers. In a few short verses we hear words like “uncircumcised,” “trance,” “beasts of prey,” “kill and eat.” and “profane.” It’s a lot of language to have to explain, and no one wants a sermon that sounds like a lecture. Others were quick to point out how important this passage has been for Christians of every time and place for understanding how the early church opened itself up to people and communities that had previously been excluded. It’s a text worth teaching, precisely because of humanity’s propensity for provincialism. Our inclination to imagine that God’s beloved community is composed of people just like us. As I was weighing the merits of these two perspectives, I learned that there were plans underway for a rally in Logan Square this weekend by a group of Christians, organized by the Illinois Family Institute, protesting marriage equality for same-gender couples on biblical grounds and I decided there is no better time to dive into the rich, if unfamiliar, world of Acts 11. The first words in need of explanation are the distinction between the believers who were in Jerusalem and the Gentiles. The “believers in Jerusalem” were the early church, the disciples who had known and followed Jesus. They were mainly Jewish people living in Jerusalem, still relating to the Temple and the worship that went on there. They were circumcised as a matter of religious law hearkening back to the covenant God made with Abraham, and which continues to this day in observant Jewish families. Though they had experienced the liberating, life-giving power of Jesus in their own lives, they still seemed to understand the significance of his life, death and resurrection as being for them, and for people like them. By way of explaining himself, Peter relates to them a vision that came to him while he was praying in the city of Joppa. Joppa was the same city from which the prophet Jonah (famous for his journey in the belly of the whale) was sent out to the wicked people of Nineveh. This historical detail, while minor, establishes an important resonance for the present story: just as God showed care and concern for the people of Nineveh, people far from the nation of Israel, and sent them a prophet — even a prophet who did not want to go — to bring them back into relationship with their Creator, so God is acting now and always to reach out to people and places imagined to be beyond God’s care and concern to include them in God’s beloved community. So, while praying in Joppa, Peter receives a vision in which “something like a large sheet was coming down from heaven.” In this sheet are “four-footed animals, beasts of prey, reptiles, and birds of the air.” In other words, this sheet from heaven is filled with all sorts of things that Hebrew scripture called unclean according to Levitical law. And so on. You get the idea. These things are unclean, even an abomination, and are not to be touched, certainly not to be consumed, to allowed entrance into the body. But this is not all that the book of Leviticus calls unclean or an abomination. Another section of the book of Leviticus detailing what is clean and what is not, often referred to as the holiness code, is found in chapters 17-26. These are the chapters where we read that “you shall not eat the blood of any creature, for the life of every creature is its blood; whoever eats it shall be cut off.” (Lev. 17:14) We also read, “You shall not round off the hair on your temples or mar the edges of your beard. You shall not make any gashes on your flesh for the dead or tattoo any marks upon you” (Lev. 19:28); and “if a man commits adultery with the wife of his neighbor, both the adulterer and the adulteress shall be put to death” (Lev. 20:10); and “you shall not lie with a male as with a woman, it is an abomination” (Lev. 18:22). What God has made clean, you must not call profane. This happens three times, the same number of times Peter had previously denied Jesus, the same number of times Jesus requested that Peter feed his sheep and tend to his lambs, as if to say that these creatures too, like the sheep and the lambs, like the wicked people of Nineveh, are cared for by the good shepherd. And then, just as he is coming out of this trance, a group of Gentiles, the uncircumcised, the unclean, arrive at the house where Peter was praying and invite him to the home of Cornelius, a Gentile, uncircumcised, unclean and the Holy Spirit moves in Peter, telling him to go with these men anyways. So he goes, and he breaks the laws of Leviticus, and he enters the home of a Gentile, and he begins to preach to that household and the Holy Spirit falls on those outsiders just as it had on Peter and all the disciples on the first day of Pentecost. If God gave them the same gift that God have us when we believed in the Lord Jesus Christ, who was I that I could hinder God? Brothers and sisters, can you imagine what thrilling and terrifying times these must have been for the early church? For these people, who understood themselves to be good, law-abiding, upright, and clean? For these people, who understood themselves as inheritors of a covenant with God? Can you imagine what it must have been like for the early church in Jerusalem to get this report from Peter, their leader, that God in Christ Jesus was rewriting the rules. That the outsiders were welcome in. That the insiders were being sent out. That the clean and the unclean, the sacred and the profane, were becoming indistinguishable from each other? 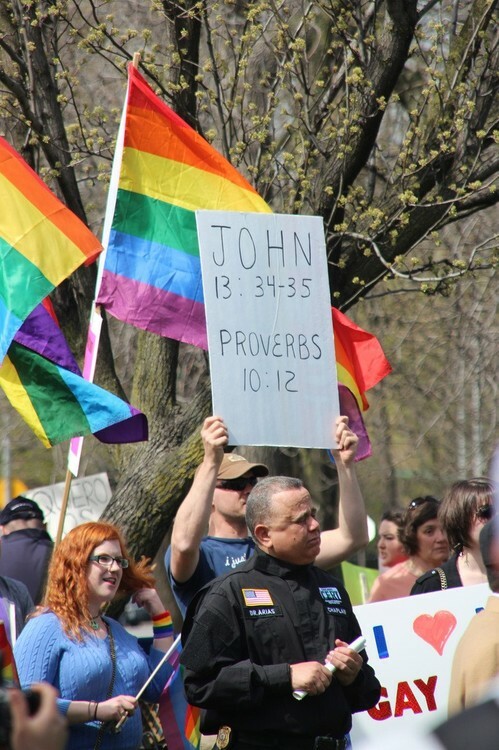 I would have expected that they would have said something like, “but the Bible says…” or “but Torah says…” God knows we hear plenty of that these days, as people march down our streets with signs quoting passages from Leviticus, presuming to tell us whom God hates. But this morning’s story from Acts tells us that God loves those whom the world hates. God makes clean those whom the world calls dirty. God welcomes in those the world shuts out. And, what God has made clean, we must not call profane. And, if God gave them the same gift God gave us, who are we to hinder God? What a great story for us to inherit! A story that says, “yes, I know what the Bible says, but I’m saying a new thing!” “See, I am making all things new! Write this, for these words are trustworthy and true.” (Rev. 21:5) Into a world filled with laws that divide us, one from another; into a world filled with faiths that struggle to find harmony between themselves; into a world filled with people, longing to be free, to come home, to belong, God establishes a new commandment, a new law, a new righteousness for those who are called children of God. This is what God’s apostles dream. This is how God’s apostles act.